The Board of Supervisors of Santa Clara County, a jurisdiction in central California, is currently weighing a series of local surveillance reforms that could establish a model for other counties and municipalities. At a hearing last Thursday—one of many so far—I spoke in support of the proposed ordinance and submitted a letter with suggested amendments. The proposed ordinance, introduced by Supervisor Joe Simitian, aims to advance transparency into the procurement of surveillance devices by local agencies and oversight of their deployment. Last week's hearing was hosted by the board's Finance and Government Operations Committee, which will reconvene in March to potentially recommend the measure for a vote by the full Board later this spring. In particular, we write to offer two suggestions for potential amendments, highlight one important component of the proposed ordinance, and present a local story from within your jurisdiction about how law enforcement surveillance can impact the lives of real people. A story our organization recently uncovered helps illustrate how the lives of your constituents can be impacted by surveillance when used without adequate safeguards. [W]e particularly praise the proposal’s recognition of a pattern and practice among law enforcement departments to seek forgiveness rather than permission, by applying the process and reporting requirements to all uses of technology for surveillance purposes, rather than a specific device. The State of California became a national leader in 2015 by regulating particular surveillance methods, specifically IMSI-catchers and Automated License Plate Reader systems, that had already been widely used by agencies across the state for nearly a decade. Your constituents should not need to wait for years before securing the public transparency your community deserves. Predictable concerns voiced by law enforcement stakeholders, including the county sheriff's office and a union representing law enforcement officers, centered on fears of officers acting in good faith inadvertently violating a use policy that the ordinance would require the county to develop. Those concerns suggest the need for law enforcement agencies to better understand the proposal, which Mr. Simitian explained contemplates criminal liability only when public officials intentionally misuse data collected from electronic surveillance devices owned by the county in a fashion specifically prohibited by the use policy. 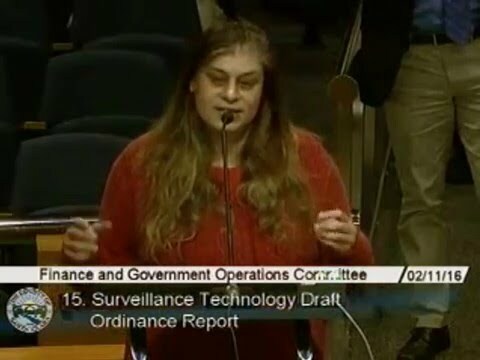 This video from the hearing begins with my comments, and includes those of several supportive county residents. The video closes with a resident of San Jose, the largest city in the county. He cleverly argues that "the opposition of the District Attorney's office regarding the great burden caused [by the measure's transparency requirements]...is honestly a cause of alarm in itself, because if the county is using so much surveillance technology that just bookkeeping is not feasible, then we already might have a problem."